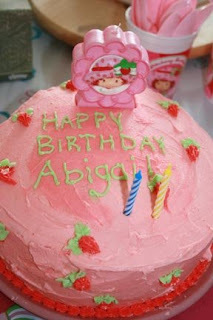 Abigail's friend birthday party was in March, and I baked her cake. My mom is a cake decorator, and I grew up watching her make birthday cakes and wedding cakes. I have decorated a few over the years, but I've never quite learned the technique. I have been baking cakes from scratch since I was about nine or ten years old, though. This particular cake is a yellow layer cake recipe with buttercream frosting. The yellow cake is a family recipe that we used for most occasions with a variety of icings, including lemon cheese (a cooked lemon curd that is wonderful), chocolate buttercream, cooked fudge, cooked coconut, caramel and more. Every once in a while one of us would get in the mood for "birthday cake" though, which was our code for yellow cake with buttercream. I have a Strawberry Shortcake pan from Wilton that I had planned to use, but I haven't decorated a cake in years, and I was intimidated by the large number of stars that I'd have to make for a cake that Abigail won't even remember. I finally decide to just decorate a layer cake. I used Wilton's buttercream frosting recipe because I couldn't find mine. I learned the hard way, though, that the Wilton recipe only makes enough to ice the cake OR decorate it. So if you want to do both, you have to make two batches. I only had four jars of food coloring (I use the gels from Wilton) so I used red to get the two shades of pink and green, of course, for the green. When I do decide to use the Strawberry Shortcake pan, I'm planning to pick up Wilton's set of Strawberry Shortcake food coloring. It should be easier to make all the right colors that way! I don't know if it's obvious or not but the little "rosettes" are actually supposed to be strawberries. I've collected party supplies for Strawberry Shortcake for two years now (first and second birthday parties). 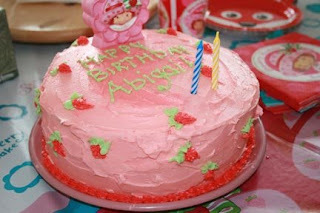 I'm hoping that we'll be able to have Strawberry Shortcake birthday parties for several years, at least. Looks delicious, love the rough pink icing. You definitely do your mom proud!